Mrs. Hankinson's Class: 100th Day! 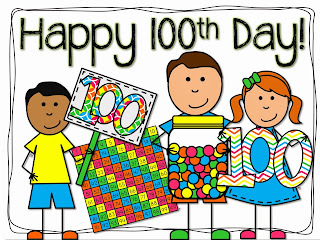 Last week was our 100th day of school! Here's what my math board looked like on day 99. We build the number using straws for hundreds, tens, and ones, as well as with money. ... it was fun to hear what my students knew that they could now do, as well as what they could and couldn't eat! And we had a special 100 day snack of 100 things, building sets of 10s. And at the end of the day with 100 built on my math board. It was a fun day! What do you do to celebrate the 100th day?